Not a busy week, but makes up for it by being pretty good. ... Although, I suppose you could say I did have a stub for that, in the form of the piece of paper taped to a seat to reserve it for me because I'm an IFFBoston member. Disappointingly, it wasn't a packed house for this preview, despite all the local festivals and horror-oriented websites saying this was likely to be good and worth watching. I was surprised how good it was, just because I half-remembered the original as putting me to sleep, but Jim Mickle did a great job with the material. It was one of two things this week where I didn't miss the bus on purpose in the morning but didn't complain, as it's a lot easier to put in a full day of work at get to a theater on the gren line in the 7pm hour from home than from Burlington. The other was Monday's screening of The Last Command at the Coolidge with the Alloy Orchestra. I thought I'd seen it with them before, but the only entry on the blog is from a Sterberg/Dietrich series at the Brattle almost ten years ago. Between and after those: The surprisingly good last-minute-replacement Jose e Pilar as part of the Gathr screening series on Tuesday; my last show in the HFA's Hitchcock series, Suspicion, on Friday; straight-from-China prequel Young Detective Dee on Saturday; and Ron Howard's latest, Rush, on Sunday. One per day is kind of short, but there's still baseball, and even though there's going to be more in October, I cling to the regular season because I don't want to let the summer go without a fight. I cringe to look at my original review of this movie, not just because the stuff I wrote nine-plus years ago is not very good (as you might expect), but because I openly admit that I arrived late and reviewed it based on that. Granted, back then I was just throwing this stuff up on the blog for my own amusement, but it was less than a month before I started writing for eFilmCritic and imported everything that thirty-year-old me didn't find too embarrassing. I've revised that review a bit. I still like the movie an awful lot, though: For all that the bits with the aged, shaky Sergius Alexandr seems kind of blunt, the movie is a fine story of not judging a man's morality by his politics, and Evelyn Brent is rather fantastic in it. And, yes, it really does pay to see it from the beginning: Missing the first couple of minutes with William Powell the first time meant that I wasn't completely keyed into his character's potential for meanness when he reappeared later, and having it in mind that this former revolutionary has the capability to be so vindictive does affect the way one looks at the character. Given how certain an element of a thriller that the shocking twist has become, the way Hitchcock's Suspicion ends is kind of a surprise on its own; it not only doesn't end the way one has come to expect, but it's even more abrupt that the typical Hitchcock finale. This isn't one of the greatest thrillers of its type - even considering that it's from 1941, it seems a bit generic, like the writers had the basic shell of a "did I marry a killer?" story but didn't really have a unique setting or character hook to run with. It's a workable enough story that actually does fairly well to keep certain things off-screen, and while it's sort of dated in spots, there's a lightness to much of the activity that makes the genuine threats that make their way into the movie that much more sinister. That includes - perhaps primarily - Cary Grant, who plays his character in much the same way he'd play his comic roles, tossing off quips and showing a casual, insouciant charm even as he's being an utter jerk, with just the sort of twinkle that lets the audience believe that his wife will give him the benefit of the doubt even when the audience is past that. Joan Fontaine isn't quite so ideal here as she was in her previous collaboration with Hitchcock (Rebecca), but she has moments, especially when Lina is allowed to be confident. Nigel Bruce, meanwhile, is kind of charming as the dimwitted Beaky, although, man, this guy is dumber than his version of Dr. Watson. I've never been a particular naysayer where Ron Howard was concerned, and am in fact usually pretty surprised when I see folks acting like he is a particular blight upon filmmaking - his stuff is mainstream, but generally fairly capable, and he's got a real knack for doing movies that are technically very difficult without ever letting the spectacle overwhelm the storytelling. (See: Apollo 13) So I'm kind of surprised that it's Rush, of all movies, that seems to be getting him some praise. It's not a bad movie, by any means; Howard really does know how to present a story clearly, neither overweighing things nor allowing the movie to feel like it's just filling time. That's a good trait to have with this movie, where supporting characters are drifting in and out and the real-life story doesn't really allow for streamlining to a simple story. He gets good performances out of stars Chris Hemsworth and Daniel Bruhl, with Hemsworth especially having great movie-star charisma that makes the movie slow smoothly and pleasantly. But, like I said, the competition between James Hunt (Hemsworth) and Niki Lauda (Bruhl) is in some ways too full of the complications of real life to make a good movie. Take how the first act introduces a girlfriend for Hunt who disappears off-screen, quite contrary to how her introduction is such a big deal. Or the structure of the 1976 Grand Prix season, which denies the audience a real feeling of head-to-head competition between the two. That may be how things went, but it's not dramatically satisfying. Plus, for all that Howard and company shoot some great racing footage, it's not great action storytelling. Getting so close to the action doesn't often give the audience a chance to see what Hunt and Lauda are doing in relation to each other during the head-to-head races. It goes down pretty easy, and Hans Zimmer contributes a good soundtrack that becomes great as the closing credits roll. Rush is certainly no waste of time, but it's not going to be one that sticks in my head. It's filmed and acted well, but it seems like it skipped the step where writer Peter Morgan should have looked at it and decided it wasn't really a movie. Okay... What comes out in China next week? Any prequels to movies I saw at previous Fantasia? My Lucky Star last week, Young Detective Dee this one, and both opening at Boston Common the same weekend they opened on the other side of the world, is probably not the start of a trend that can be extrapolated past this week (although it would be pretty awesome if AMC saw them doing well enough that they tried to bring something else in next), but it's been fun. As with Lost In Thailand seven months ago, this seems to be a deal that AMC negotiated directly with the Chinese studio, which on the one hand is pretty cool if they're going to make a regular thing of it, but must kind of stink if you like these movies but don't live in an area with AMC theaters. I kind of wish they'd picked it up in 3D, but having been around for the thud Tsui Hark's Flying Swords of Dragon Gate landed with when it played in Imax 3D, I can't blame them for not being willing to test how much the folks in Chinatown will pay for a movie ticket. Maybe it will be one of those 2D/3D Blu-rays, although I kind of wonder who will distribute it. There's no region 1/A Lost in Thailand yet, for instance, and the guys who distributed the first movie, Indomina, don't really seem to be doing much any more. I could see the likes of Well Go picking it up, but if so, wouldn't they have done so for the theatrical run, too? The upsot of all that meandering: This movie's a ton of fun, and the way its US release is happening means your best chance to see it is probably if it's playing at an AMC theater this week. Catch it now, while you can. I've got to confess: When I hoped for more Detective Dee movies after seeing Mystery of the Phantom Flame a couple years ago, I didn't really think I'd get them. Happily, it seemed the people of China also wanted more, and director Tsui Hark also seemed to have a soft spot for the character that revitalized his career. Apparently star Andy Lau wasn't quite so enthusiastic, so Hark went and made this one a prequel. But don't worry about that making it predictable; despite knowing Dee will still be around at the end, this bit of martial-arts-mystery-fantasy-adventure is even more crazy - and just as much fun - as its predecessor. Things kick off in 665 AD, with Empress Wu Zetian (Carina Lau) effectively in control of a Middle Kingdom at war with its neighbor Yuya. When a fleet sent north to confront them is eradicated and the survivors make noises about a sea dragon, she orders Da Lisi chief Yuchi Zhenjin ("William" Feng Shaofeng) to investigate while the commoners make plans to appease the gods with a ceremonial fasting by courtesan Yin Ruiji (Angelababy). A new arrival in the capital city of Luoyang, Dee Renjie ("Mark" Chao You-ting) gets wind of a plot to kidnap Ruiji even before reporting to Da Lisi headquarters to begin as a detective, and gets to the temple just in time to break it up - although he does not have an immediate explanation for the lizard-man who shows up midway through. Yes, a lizard-man. Those who had issues with the more fantastical elements of Phantom Flame may as well just accept that things are going to get weird here as Dee and company find themselves faced with creatures of all shapes and sizes. Hark happily takes detours into horror territory here, but in some ways, that just adds to the "Chinese Sherlock Holmes" vibe of the character, as Holmes debunked his share of monsters and didn't always play fair with the reader in his adventures. While Hark and co-writer Chang Chia-lu put a fair amount of not-always-sophisticated humor into the flick, the Sherlockian aspect of the story certainly comes through as he tries to find a logical explanation for the monsters plaguing the city with his close observation of the evidence, broad knowledge of many subjects, and physician sidekick Shatuo Zhong (Lin Geng-xin). 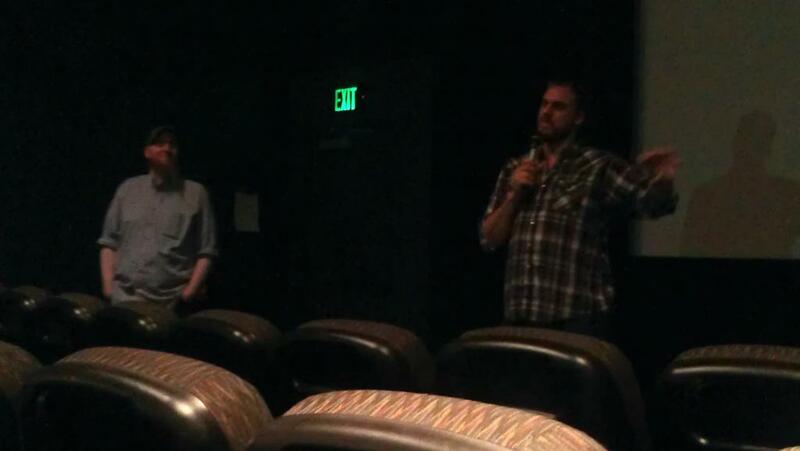 Fun fact: All three times I have seen one of director Jim Mickle's films, he's been there for a Q&A with the audience: I saw Mulberry Street at Fantasia in 2007, Stake Land at IFFBoston in 2011, and now this one at an IFFBoston preview screening. So, he'd better bring Cold in July to a festival I'm attending or one of these previews. My streak is important. He was a pretty good sport during the Q&A session, dealing with the "please tell us what happened after the bit you deliberately left ambiguous" question and a guy who asked if his next one was going to be "another pretentious Hollywood movie" with a smile on his face and correcting folks who got the wrong idea about something without being mean about it. He's a genuine horror fan, but it doesn't manifest itself in being an encyclopedia; rather, he breaks down what makes these movies work and puts that into good ones. I think that's a big part of what makes We Are What We Are work - it's about something outrageous that is grounded in very familiar pressures and feelings. Even before Mickle mentioned that part of the reason he inverted the sexes of all the characters was because he wanted to explore the idea of how religion (and, to be fair, tradition in general) often places certain demands on women, it was pretty clear in the film. It's also what makes it a very good translation; while it's been a while since I saw the first We Are What We Are (and it had trouble gaining traction with me at Fantasia in 2010), but its themes are probably more accessible to Americans than the life-cheapening poverty and pervasive Roman Catholicism of the Mexican version. Another fun thing was how he talked about sequels. If you've ever been to a Q&A for a horror film, questions about those come up naturally; audiences just expect franchising from that genre in a way that they don't for others, even though the filmmakers often make these movies with the idea of them being inexpensive stepping stones to something bigger. So when Mickle answers a bunch of questions with "that's a sequel", it's pretty amusing, even if he is telling tall tales or hypotheticals. For instance, he claimed that original-film director Jorge Michel Grau was working on a movie which would combine the surviving casts of both versions of the movie, which would sound goofy except that convergence seems to be a thing nowadays (consider the ending and vaguely discussed plans to follow up the new Evil Dead, or The Avengers). Another one he mentioned actually has an IMDB entry - What We Were would be a prequel that explains how the parents met up and how outsiders get brought into this society. I'm not sure it's really the greatest idea, but the team attached is interesting - Mickle's co-writer Nick Damici on script and Antti-Jussi Annila directing. Annila is particularly curious because he two previous features, Jade Warrior and Sauna, have been very specifically Finnish, even if much of the former is set in China. This would have to be very specifically American. Of course, there's a good chance of that never happening, so let's just focus on this one for now. It's opened in some parts of the country already, and is scheduled to hit Boston on 11 October. Definitely worth a look this Halloween season. We Are What We Are makes a heck of a case for the much-maligned idea of remaking a foreign film in English. Though the original Mexican version was much-beloved by many (I thought it had a great opening and a slick finale without grabbing me in between), rising star Jim Mickle has built something even better, something that evolves into one of the most engrossing horror movies of the year. There's a storm hitting upstate New York as the movie starts, and Emma Parker (Kassie DePaiva) heads into town to get some supplies. She's nervous, twitchy, and ill, falling down dead in the convenience store parking lot. That's never a good event for a mother of three, but given that her family - father Frank (Bill Sage), daughters Iris (Ambyr Childers) & Rose (Julia Garner), and young son Rory (Jack Gore) - are at the start of a traditional fasting period, with Frank showing many of the same symptoms she is, things get even more tense as Frank declares that Iris, as the woman of the house, will take Emma's place in the ritual that ends the fast. She wants no part of it, but tradition is tradition. Director Jim Mickle and regular co-writer Nick Damici (who also plays the local sheriff) are making their third feature here, and it's very impressive how they continue to improve even after having started strong with Mulberry Street. This is certainly the most polished-looking film they and regular director of photography Ryan Samul have made, but that's just the start. This group has always had a knack for filling their movies with characters who are just as interesting as their frightening circumstances, and they give themselves quite the challenge by centering the film not on regular people in a horrific situation but the ones who would lurk around the edges of conventional horror films. The brilliance of this one is in how Mickle and company manage to present its main characters as both at once. The original movie scheduled for this time was Operation E, but that fell through over the weekend - from the sound of Gathr's email, it seems as though getting a Blu-ray authored with proper subtitles of this fairly new film just wasn't happening. Given the 2010 copyright on José e Pilar, it kind of looks like they were looking for something that wouldn't cut things particularly close with their substitute. Fortunately, it's still a pretty nifty movie that was surprisingly engrossing. I spent the day not so much dreading the longish documentary on a foreign author as feeling kind of tired and unsure whether I'd make it to the end, but that never proved to be a problem. It's one of the best-put-together movies of its type I can remember seeing, with very little glancing at the watch but plenty of writing stuff down in the notebook that I might want to remember for the review. In the end, I didn't wind up using a lot of it, although it makes me curious about how directors choose to add overt structuring to docs like this. José e Pilar has three acts announced with on-screen captions, and puts a lot of dates on-screen. It's kind of a delicate balance, as this movie goes for fly-on-the-wall access with minimal cutting to other people, and each bit of text reminds the audience they're watching a movie rather than just sitting in the room. They do a fine job of creating associations with facts, though, and Mendes has a strong enough grasp on his subjects as characters to get away with it. The time period covered by José & Pilar aligns, roughly, with the time it took Nobel Prize-winning writer José Saramago to bring his book The Elephant's Journey from concept to release, and that sounds like a fairly dull sort of thing to watch. And it likely would be, if it were entirely comprised of Saramago sitting in front of his laptop, typing. But he and his wife Pilar del Rio aren't the type to let the grass grow under their feet, and director Miguel Gonçalves Mendes never seems to be more than a step or two behind them. Many coming into the movie will know something about José Saramago: Though he did not write professionally until the age of sixty, he became renowned around the world. His native Portugal, however, reacted poorly to his book The Gospel of Jesus Christ and he had at the time of filming spent recent years on Lanzarote Island (one of the Canary Islands, a Spanish territory). When he's there, he works on his book and also helps to build a library, but an author of Saramago's renown is in demand for appearances all around the world, and he's still healthy enough to do do that sort of travel, despite being 83 years old, as the film starts. Aside from a little text at the beginning to establish Lanzarote as his home, the film doesn't feed the audience the details on José Saramago's life story until reasonably late in the game, and in that way is able to focus on who he is in the present (well, the film's present; Saramago passed away after it finished shooting in 2008), and he's an interesting set of contradictions: Though his books frequently address spiritual or Biblical topics, he tells of being a life-long atheist; and while his words are often those of a cynical curmudgeon, he finds plenty of joy in small things and pleasantly talks to any visitors to the island who meet him in the library and cannot justify denying fans a moment of his time or an autograph. His face may be set in a permanent frown, but he's got quiet, surprising charisma. New movies coming out, and among other things, we get a Chinese movie opening day-and-date in the United States for the second week in a row! It's like the world knows it's my birthday next week. That would be Young Detective Dee: Rise of the Sea Dragon, a prequel to Detective Dee and the Mystery of the Phantom Flame. This one brings back Tsui Hark as director and Carina Lau as the Empress as Dee Renjie arrives in the capital and is promptly put to work on a case that appears to involve lizard-man assassins. In related news, Tsui Hark is nuts, and I must admit to sadness that we apparently aren't getting this thing in 3D. It's at Boston Common. One thing that is playing in 3D is Cloudy With a Chance of Meatballs, a sequel to what I'm told is a genuinely fun and funny kids' movie. This one certainly looks extraordinarily pretty and offbeat. 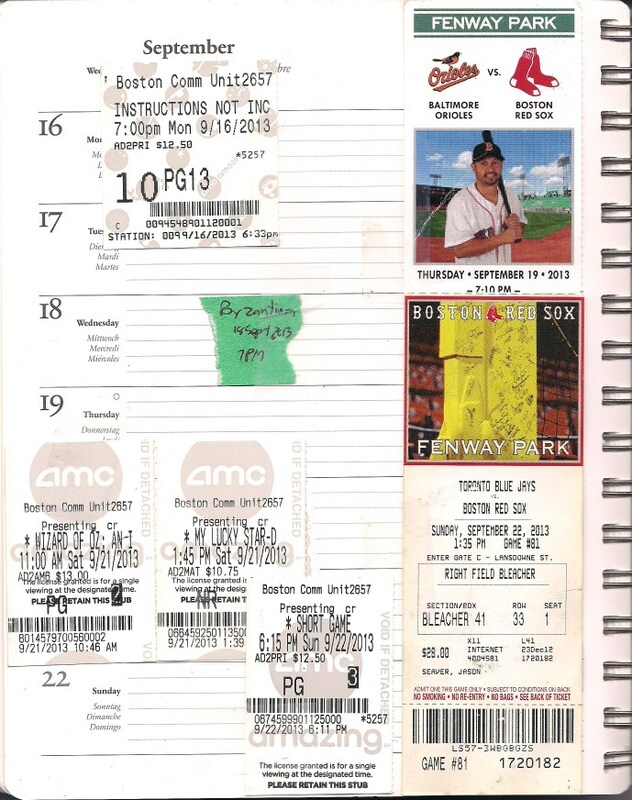 It's at the Capitol, Apple (2D only), Boston Common, and Fenway (including RPX matinees). Also opening is Rush, Ron Howard's long-awaited return to fast-car movies, though this story of rival Formula One racers is sure to be much glossier and more respectable than his old Roger Corman stuff. It's at Somerville, Apple, Fenway, Boston Common, and the SuperLux. There's also Baggage Claim, in which a stewardess played by Paula Patton crisscrosses the country looking reconnect with one of her ex-boyfriends (including Djimon Hounsou, taye Diggs, Derek Luke, and Boris Kodjoe). It's at Fenway and Apple. The Imax screens at Boston Common and Jordan's Furniture are also picking up Metallica: Through The Never a week early; it's apparently half concert, half surreal adventure, and while the first doesn't interest me much, that Nimrod Antal directs has me curious about the rest. You can double up on hard-rock-docs with the Def Leppard Viva Hysteria concert on Wednesday at Fenway. Another mainstream, Don Jon, movie is opening wide enough to play the Coolidge as well as Somerville, Apple, Fenway, Boston Common, and the SuperLux; it features Joseph Gordon-Levitt, who also writes and directs, as a New Jersey player who may have found true love with Scarlett Johansson but doesn't know what to do with it. They're also getting Enough Said, with Julia Louis-Dreyfus and James Gandolfini (in his final role, dammit) as a pair of divorcees falling in love. Kendall Square's got it too. They've also got a screening or two each day of this year's Manhattan Short Film Festival, which groups ten shorts and allows the public to vote on which they like best. There's also midnights of Troll 2 on 35mm Friday & Saturday, a fitting as heck way to end a "so bad it's...something" shows. They also bring in a 35mm print of David Lynch's Eraserhead as the Big Screen Classic on Monday. Kendall Square picks up another two movies in addition to those opening in Brookline. Inequality for All features Robert Reich discussing how the growing gap between the super-rich and everyone else is hurting everyone. The one-week booking is Haute Cuisine, features Catherine Frot as a talented chef plucked out of obscurity to be the pesonal cook for France's President. The Somerville Theatre has The Muslims Are Coming! booked for a week; it's a documentary about a group of Muslim comedians who tour America to try and present themselves as not scary but funny, just like everyone else.. Directors Negin Farsad & Dean Obeidallah will be on hand for post-film Q&As on Friday. The Regent Theatre also has a couple screenings of the Manhattan Short Film Festival coming up at 7pm on both Sunday and Thursday. Midway between, Tuesday's entry in the Gathr Preview Series is one I'm pretty excited about; everyone who saw The Broken Circle Breakdown at Fantasia told me it was extraordinary, although crushing. It has also just been selected as Belgium's submission for the Foreign Language Film Oscar. The Brattle Theatre welcomes back IFFBoston selection Good Ol' Freda, a documentary on the indispensable first president of the Beatles' fan club. It plays daily, although the 9:15pm show is Blue Caprice, a much-lauded portait of the Beltway sniper attacks - told, unusually, from the vantage point of the shooters. The exception is Tuesday, when Freda only plays at 3pm and Balagan presentsLa Cicatrice Interieure (The Inner Scar), a 35mm print of an eye-catching underground film whose soundtrack would later be released as an album by Nico. 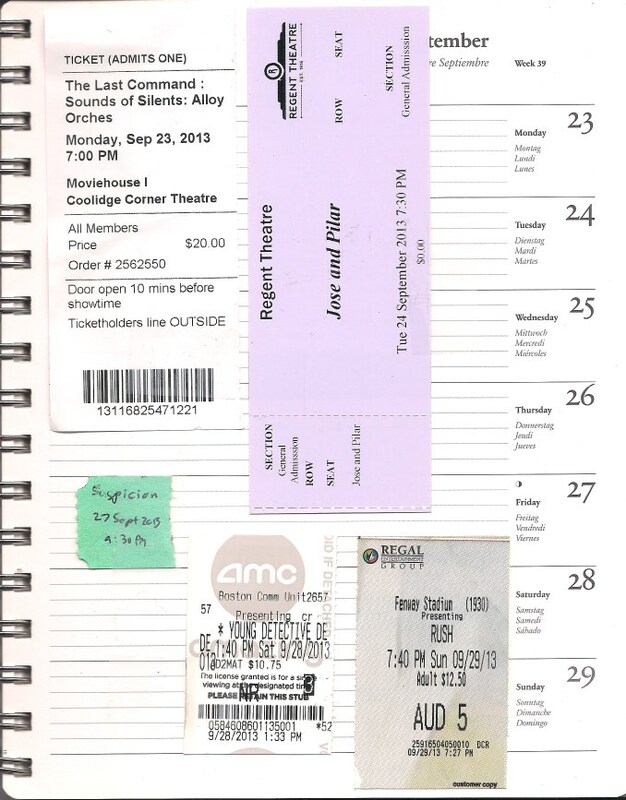 With the end of the month comes the end of the current the Harvard Film Archive calendar. Nuvove Visioni: Italian Cinema Now wraps up with The Double Hour (Friday 7pm), Il Divo (Saturday & Monday 7pm), and I Am Love (Sunday 4pm). It's also the end for Complete Alfred Hitchcock, which finishes with Suspicion (Friday 9:30pm) and Shadow of a Doubt (9:30pm Saturday). The other slot in the weekend has Portugese artist Salomé Lamas present to introduce her new film No Man's Land at 7pm on Sunday. There are also VES screenings of The Man with a Movie Camera on Tuesday and Wednesday, with Tuesday's preceded by the new short "Time Exposure". The MFA holds The Wall, The Legend of Cool "Disco" Dan, and Far From Vietnam over for the weekend, with Disco and Vietnam also continuing into October. Wednesday 2 October also sees Herb & Dorothy 50x50 join the rotation, and I'm guessing that all of us who saw Herb & Dorothy will want to revisit these everyman art collectors as they donate a large chunk of their massive collection to museums in every state. Thursday the 3rd is the start of The National Center for Jewish Film Mini-Festival, kicking off with Czech noir In the Shadow. ArtsEmerson features two documentaries this week, with Gideon's Army telling the stories of a group of Southern public defenders Friday evening, while Big Words runs Saturday evening and Sunday afternoon, and reunites three former members of a hip-hop group that never made it big on the eve of the 2008 election. The Bright Lights programs include Evocateur: The Morton Downey Jr Movie on Tuesday the 1st and YERT: Your Environmental Road Trip (with director Ben Evans there for Q&A after) on Thursday the 3rd. The ICA has a couple different films this weekend: Unbound, Scenes from the Life of Mary Shelley, imagines the Frankenstein author's life as a series of home movies, and plays Friday evening. Saturday evening and Sunday afternoon, on the other hand, feature what looks to be the first in a monthly "Art Over Politics: The Persistence of Dreams" series, with Salma a biography of a Muslim Tamil poet who was literally locked away from the world during her adolescence. The Capitol wraps their September Tarantino series up with Inglorious Basterds, Friday and Saturday at 10:30pm. My plans? Finish the Hitchcock series with Suspicion, catch Young Detective Dee, Rush, and maybe Don Jon. Probably try and watch my copy of Cloudy #1 before tackling the sequel. And probably a lot more. Last week of Red Sox home games of the regular season, so, yeah, let's get to Fenway a few times. Stubless: The Red Sox vs. the Orioles on the 17th. One of those full-sheet-of-paper printouts, so it's not lost, but just too big. Three games this week, though it wasn't originally planned that way. The Sunday game was purchased as part of one of those four-packs back during the winter, but I picked up Tuesday's game when I got back from Montreal, saw the Red Sox were waiving fees for online ticket orders that weekend as a Sales Tax Holiday offer, and lucked into the one Thursday because someone had an extra. On the whole, a fun set of games. Tuesday's was a let-down at the end, when the almost unfathomable happened and Koji Uehara gave up two hard-hit balls in a row, allowing the Orioles to score the winning run; he had been automatic for the past couple months, including a hidden perfect game and then some (thirty-odd straight batters retired in relief). He got some deserved applause, and while we probably won't be taking him for granted, I still figure to be saying "Koji's got this" when there's a lead in the ninth, because he regularly makes batters look silly. The Sox salvaged a win from the series on Thursday, though, with an excellent start by John Lackey, which is becoming so commonplace this year that the jokes about how I never thought I'd see the day when I'd look forward to him pitching have become old and stale. Apparently it's my fault that it wasn't as good as it could have been; after the sixth inning I turned to Tony and asked if MLB Network was switching to the game, he asked why, and I said six innings without a hit allowed. Soon after, Brian Roberts hit one to the parking garage, and I was informed that he obviously heard me from five hundred feet away, and this gave him the extra bit of inspiration he needed. People believe weird things. The last home game of the year was another one that went by quickly. I had extra tickets because the last couple of years have been lessons in how making general plans well in advance (buying enough tickets to bring family members to a few games) tends to fall in he face of specific plans made closer to the date. I might have been able to unload them, but I always forget how the "scalp-free zone" works, and wound up in the park early rather than the part of the gate where you can sell them. Ah, well. It was a beautiful afternoon, the game moved quickly - the other team pitched a knuckleballer who had a good day around the homers by David Ortiz and Jackie Bradley Junior - and I moved down to hang with Tony & Ken for the last couple innings Now it's time to start figuring out how many postseason tickets I can afford. Even with all that baseball, there was plenty of time for movies. Most of it was spent at Boston Common for some things that didn't quite get a wide release: Monday, I finally got around to seeing Mexican comedy and sleeper hit Instructions Not Included, which has hung around for a month and was good enough to merit a little thinking about later. Saturday was a double feature, starting with The Wizard of Oz Imaxified and threedeified, followed up by Zhang Ziyi's My Lucky Star. That's something like the third follow up to a hit Chinese romantic comedy that China Lion has brought over day-and-date with Beijing despite the first not having been much of a blip in the States (Sophie's Revenge came out in 2009, I saw it at Fantasia in 2010, and it finally hit region-one DVD in 2012). Shows how much they're targeting the expatriate/immigrant audience, even though this one stands quite well on its own. Finally, I made it back there after the last ballgame for The Short Game, a documentary on seven and eight year-olds who play golf that's kind of adorable. In between, I made it to the Brattle for Byzantium, which was supposed to have played at Kendall Square back in July but got yanked from the schedule, but was fairly well worth a bit of a wait. I'm not a particular fan of vampire stories, but when you cast Gemma Arterton and Saoirse Ronan in a movie, you get my attention and raise my expectations. I gather Neil Jordan with vampires perks some other folks' antennae up, though, although the vampires in Moira Buffini's script (based on her own play) are unconventional enough that I half-wonder if they're only called that because it brings people in. Still, I do quite like it as a larger-than-life story of a mother and daughter. I especially love the arc Gemma Arterton's Clara takes in this movie and what it says about the world: The flashbacks reveal a woman who saw an opportunity at controlling her own destiny and seized it, and for that is disparaged as an abomination even by other vampires. It's a bit of a paradox that two hundred years later, she's still trading on her body, but there's something harshly true about how it's hard for her to see herself as anything but the harlot men have made her feel like, even when she does demonstrate a fierce intelligence and sense of initiative, especially when it comes to protecting her daughter. I really hope that the way Arterton fills out a series of tight/skimpy costumes, and how her character always seems lower-class, doesn't completely blot out how great she is in this. Saoirse Ronan is just as good, especially since her character is fitted with a backstory that makes it relatively easy to believe that she would still be acting like a teenager after centuries. She gets across this great combination of young and old, a modern sixteen-year-old girl until you scrape a little bit off the surface, familiar with death and for all her intelligence, still able to be shielded by her mother. Her love story is impulsive but invested with a familiarity that makes one wonder how often it's played out in another way. It does kind of suffer from the issue of being a small story told on the fringes of a larger one, which can often be a problem, but more or less rights itself at the end. Jordan and cinematographer Sean Bobbitt do a great job of capturing the setting of a seaside town in the off-season, and they found a great spot for some of the most pivotal scenes. There are bits that could be better, but since Jordan absolutely does not waste his two lead actresses, it's still damned good. Don't think less of me, but I never really connected to The Wizard of Oz. Despite getting ample opportunities during its annual Thanksgiving broadcasts on CBS, the magic was just never there. I later came to like the basics of the story - Marvel's adaptations of the original L. Frank Baum novels by Eric Shanower and Skottie Young get picked up in hardcover, and I dug Sam Raimi's prequel movie this year - but the 1939 movie? I acknowledge it as a classic, wonder why there weren't many other fantasies made during Hollywood's "Golden Age". But, revisiting it as an adult... Man, do I find that this thing has problems. Like the way Dorothy and company seldom really seem to do anything to earn her way home - Glinda just makes it snow in one scene after the members of the party who need to breathe have passed out, and if water is so dangerous to witches, why is there just a bucket of the stuff lying around, especially since her minions don't seem too disappointed when she melts? Plus, given that Judy Garland doesn't particularly look like a pre-teen, "there's no place like home" seems to be a horrible lesson, the exact opposite from the attitude you'd want an intelligent, curious teenager to have. It'd be different if Dorothy looked like a nine-year-old, but she really doesn't. That said - there's still a lot about this movie that's wonderful. For all that it hits its themes and lessons directly enough for the four-year-olds in the audience to not miss anything, it doesn't ever seem to be going overboard in anything. Even the big song-and-dance numbers are just enough. I love the Scarecrow more than I ever did as a kid, just because I can see how Ray Bolger is absolutely nailing the body language of a man whose body is filled with straw rather than bones and tissue, and the make-up job is really incredible - I can't see where the sack ends and his face begins. The restoration/conversion job to get it in IMAX 3D is also one of the best you'll see, especially the way it takes the inherently two-dimensional backdrops and gives them depth without changing their essential character. I'm probably never going to love this movie, certainly not like my nieces do, but I certainly like it enough that I'm glad I went to the IMAX show out of more than just curiosity. Hey, it's an entry that I'd feel pretty good about my family reading, what with a number of them liking golf and/or having kids, and the most objectionable material being a couple instances of parents swearing when things don't go well on the golf course. And the movie itself is one I'd recommend to a few folks in my family specifically, as I remember my sister-in-law commenting a year or two ago that they were trying to find good documentaries for their daughter to watch, which isn't as easy to find as you might expect. This one, though, is not only kid-friendly, but pretty much every important character is about the same age as my niece (who turns seven next week). I'm not sure whether it will make it to a theater in southern Maine for my nieces and their parents to see it; the national release was tiny and it didn't tear up the screens with the sort of attendance that gets it an expansion - when you're a small movie made with kids in mind, it probably doesn't do you any favors to come out the same week as a special Imax 3D run of The Wizard of Oz. But given that one of the studios releasing it was Netflix, it will probably show up on their servers double-quick, if it hasn't already. It's worth a look - unabashedly a cute, upbeat movie with adorable little kids, but excellent at being that sort of movie. It feels like it's been a while since a documentary about kids who do something well and compete to see who does it the best has worked its way into a decent number of theaters, and The Short Game is a good one. Sure, It skews far more toward the adorable than the controversial, but not beyond the bounds of credibility. Anyway, there are far less enjoyable ways to spend an afternoon at the movies than watching second-grade golfers. The filmmakers pay visits to seven-and-eight-year-olds from around the world before they converge on Pinehurst, North Carolina for the annual children's golf championships. There's Allan Kournikova, a seven-year-old extrovert from Palm Beach who won the tourney in his age group last year and whose older sister is also a well-known tennis player; Zamokuhle "Zama" Nxasana, an outgoing South African boy; Kuang Yang, a Shenzhen boy who picked up an instructional DVD at two thinking it was a cartoon; Alexa Pano, last year's girls' champion and Allan's best friend; Jed Dy of Manila, autistic but high-functioning; Augustin Valery, a Parisian eight-year-old from a family of achievers; Sky Sudbury, a pink-clad pixie who shows not everything is bigger in Texas; and Amari Avery, an intense competitor called "Tigress" for how much of her background she shares with Tiger Woods. All are shadowed by "Daddy Caddies" (even if, in some cases, it's the mother) who take things quite seriously themselves. First and foremost, they're a great bunch of kids, whether they love playing to the camera as much as Allan or shy from it like Jed. As focused as they can be when playing golf - and the crazy hours they put into it, from early morning strength training to hitting balls right up to bedtime - they are all bright, energetic, funny kids who smile a lot, ramble the way that children that age are prone to do. In most if not all of the cases shown, their enthusiasm seems to come from themselves rather than pushy parents. And while parental intensity can be a lot less fun than the kids' in these stories, what we see of them is often less pushy than having to learn how to handle very talented kids - and even that is somewhat in the background.